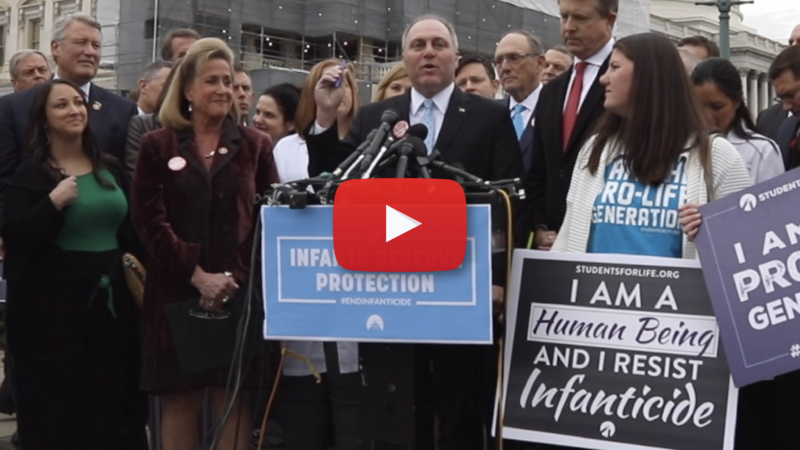 WASHINGTON, D.C.—House Republican Whip Steve Scalise (R-La.) hosted a press conference today with Congresswoman Ann Wagner (R-Mo.) to announce the filing of the discharge petition to force a vote on the Born Alive Abortion Survivors Protection Act,and allow all Americans to see where their representative stands on this important issue of protecting innocent life. Whip Scalise and Rep. Wagner were joined by fellow Republican leaders and leading pro-life advocates, including, Melissa Ohden, founder of the Abortion Survivors Network; Dr. Christina Francis, chair of the Board of the American Association of Pro-life OB/GYNs; and Jill Stanek, a former RN from Illinois who held an abortion survivor until he passed away. They each shared powerful, personal testimony as they called for all members of Congress to sign the discharge petition and protect life. Click here or on the image above to watch the press conference. “It’s shocking. It’s shocking; it’s disgusting. It’s something that no American should stand for. In fact, when you talk to people from every walk of life, Republicans, Democrats, Independents, pro-life, and yes, even most pro-choice Americans recognize that a baby born outside the womb should have the full protection under law, yet it doesn’t. “We need to pass this law for the very reason that we see states right now, like New York, celebrating the fact that they can murder a baby after it’s born alive outside the womb. It’s wrong. It’s not only wrong, it’s murder and it shouldn’t be legal. “When people say, ‘Does it take an act of Congress? Why do you need an act of Congress?’ We shouldn’t have to be here today having this discussion, but we have to stand up for those babies because it is happening in America. In fact, in many states in the nation, they don’t have that same legal protection that states like my home of Louisiana have had in place for years. Where we say that you can’t murder a baby after it’s been born alive. That protection doesn’t exist in every state and it’s under attack. We need to make sure that this is a law that is consistent all across the board. “Nancy Pelosi refuses to bring this bill up. You know what, the good news is that all of us here today have a message for Nancy Pelosi: If you won’t bring it up, we’ll bring it up! That’s what this discharge position is about. Starting today on the first vote series, I will be joining my colleagues, starting with Ann Wagner, in signing a discharge petition that makes it clear to everybody across the country: You can’t say that you’re pro-life unless you sign the discharge petition to bring this bill up for a debate and a vote on the House floor. That’s the only way to make it happen. But we can make it happen even if Nancy Pelosi won’t. “How can you have a leader in Congress say that they think that it is ok to murder a baby once it’s born outside of the womb? It’s happening, we’re here to make it stop. I applaud all of my colleagues for their leadership in starting what is going to be I think a movement all around the country. As people watch this debate and as momentum grows, my goal today is that we have over 100 members of Congress sign the discharge petition on day one. We need to get to 218, so it’s going to take a national effort. The country is watching. “People say that it should be easy to get to 218 signatures. Frankly, it should be easy to get all 435 members of Congress to sign this, but it’s not. In fact, it’s going to be hard. We know it’s an uphill battle, but we don’t come here to do the easy things. We come here because it’s hard and we’re here to do the most difficult and toughest things, and most importantly, to stand up for the most vulnerable among us.